Moorefield and East Hardy Wrestling programs have been navigating the map of success one match at a time making progress building young programs into tough challengers yielding seven combined medals at the Region II Wrestling Tournament in Braxton County capped off by the Yellow Jackets claiming one title and sending three grapplers to the state tournament in Huntington. “Our guys are wrestling well. Starting out today and prepping for this weekend, all we asked of them was to give us their best effort. They’ve all done that. 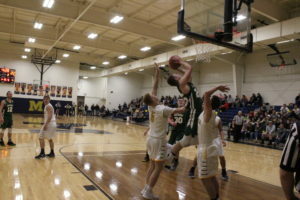 That is what we are shooting for, trying to peak at the right time,” Moorefield Wrestling Coach T.J. Van Meter stated. 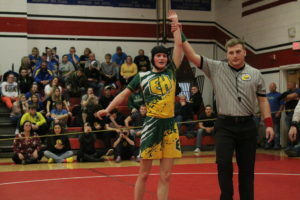 History was made for the Hardy County wrestling squads as Isaac Van Meter became the first Moorefield freshman to become Region II champion and East Hardy freshman Sierra Marie Miller is the first female to earn a medal in school history as a fifth place winner. Additionally the Yellow Jackets will be sending the most wrestlers in program history to the state tournament with three wrestlers: Paxton Coby, Isaac Van Meter and Kevin Wetzel. The wrestlers competing at the Region II Tournament from Moorefield were: Isaac Van Meter (160-lb. ), Kevin Wetzel (138-lb. ), Paxton Coby (120-lb. ), Matthew Wright (145-lb. ), Jackson Weese (126-lb. ), Owen Hartman (152-lb. ), Rodney Wratchford (170-lb. ), Allen Hardbarger (182-lb.) and Joseph Palm (285-lb.). The East Hardy grapplers competing at the Region II Tournament were: Sierra Marie Miller (113-lb. ), Sky Spell (138-lb. 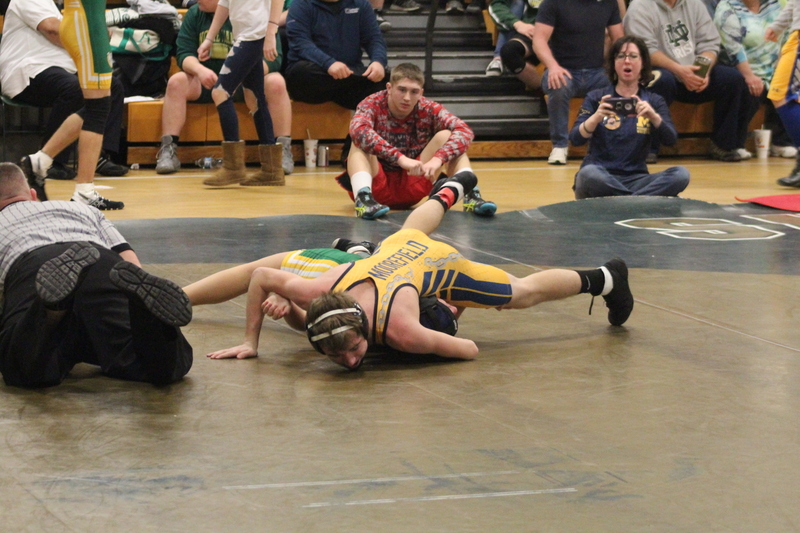 ), Cole Pusl (132-lb. ), Hunter Ames (220-lb. ), Patrick Helsley (182-lb. ), Nathan Phillips (126-lb) and Dayton Miller (170-lb.). The seven wrestlers earning medals were Moorefield’s Van Meter (champion), Coby (4th), Wetzel (4th), Wright (5th) and Weese (6th), plus East Hardy’s Sierra Marie Miller (5th) and Spell (6th). All of these grapplers had an opportunity to earn state tournament spots on the second day and three advanced. Hardy County Schools Superintendent Sheena Van Meter, Isaac’s mother, was there to support both Moorefield and East Hardy wrestlers showing county pride with a sweater featuring both team logos. “I’m ecstatic that the county’s wrestling programs are growing. I’m a huge proponent of high school athletics and have always felt that wrestling promotes accountability and responsibility. You learn to accept defeat without anyone to blame and in turn, you can take credit for your accomplishments. 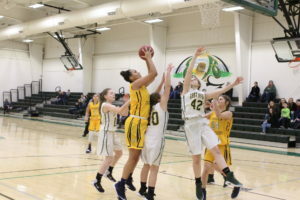 I’m looking forward to watching both East Hardy and Moorefield’s programs continue to blossom in the coming years,” Hardy County Schools Superintendent Sheena Van Meter commented.